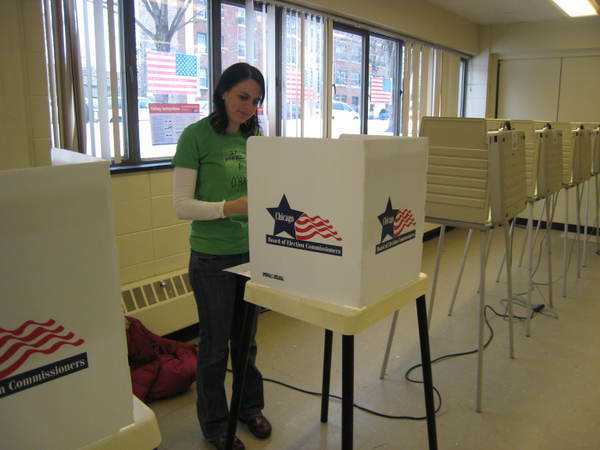 Now that I've brought up Election Day, I'll go ahead and point you to a little article I wrote about the experience of covering the 2004 election as part of the independent media. It's part of a week-long forum on the Free Press Action Network, "Media Coverage and the 2008 Elections." You can join the forum and post any thoughts you might have on this topic yourself. "Hillary Clinton should really be saying muchas gracias today." I have long been an advocate of optical-scan ballots. They've got a good track record and hold up well in both the transparency and mechanical function categories. However, yesterday was actually my first time voting on an optical scan ballot. The most notable part of the experience was the fancy, expensive-looking pen they gave me to vote with. I am kicking myself that I didn't get a picture, but found this close cousin online. It's what I would call an "artist's pen," at least that's what Faber-Castell names the pen pictured here. I venture that on the open market they cost at least a $1.50 a piece. I presume that the Chicago Board of Elections gets a deal on them. 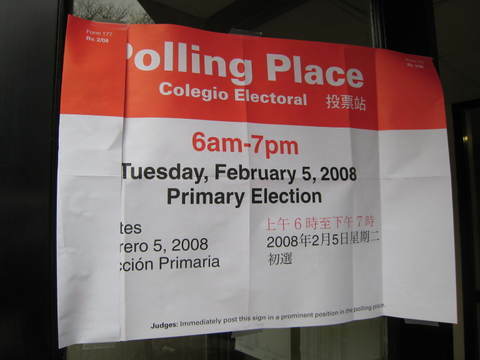 The ballot is filled in by connecting the gaps in a black bar to the right of the candidate of your choice. Then you take your ballot to the counter, where you feed it in and make sure that it works. I almost walked off with my fancy pen, but realized on my way out the door and backtracked to return it. The election judges were most grateful for my honesty. I have to imagine they lost quite a few pens over the course of the day, either by accident or theft. Apparently, said city election board spokesman James Allen, the poll workers told incredulous voters—including one spouse of an election judge—that the stylus used for touch-screen voting was actually an inkless pen to fill out paper ballots. "You spend months trying to prepare for every contingency," Allen said. "Trying to anticipate every possible way people might be confused . . . then this? Incredible." Even the ballot scanning machine knew better, he said, rejecting all 20 ballots as blank. "Each time, the judges overrode the scanner and recorded the vote," he said. By 3 p.m., only five of the 20 voters had been contacted to return to recast their votes. This incident demonstrates a more fundamental problem facing proponents of electronic voting, one that no engineer or computer science wiz can solve: poorly trained polling officials. And as with many problems at the polls, the devil is in the details and one is never certain of the exact combination of incompetence and malintent at play in any given situation. 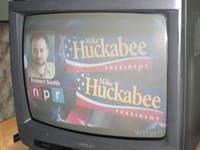 Here, I cannot resist the shamless plug for Election Day, the documentary I produced about a dozen voters and pollworkers around the country on November 2, 2004. Our footage highlighted the human element in the voting process, which can do much good (passionate individuals whose committed actions make our democracy tick) and much harm (ala invisible pen, mischievous political machinery, overwhelmed bureaucracies, etc.). At the end of the day, at least one voter at said precinct voted successfully with a ballpoint pen, begging the question of whether or not the fancy felt-tips were necessary and whether the money might have been better spent on an extra hour of pollworker training. I'll leave you with this picture of me, happy as a clam to be casting my vote, with my very fancy pen. WTTW/PBS really takes the cake. Each time they have the voice of an NPR reporter (and while we're on that topic, which producer thought that the voice of a radio reporter makes good TV? ), they splash not one, but two, bumper stickers of different candidates across the screen. Folks, it's fresh, it's unique, and it's totally 1982. What more could you ask for in an electoral visual aide? It's Super Fat Tuesday. I'm settling in for a long night of result-watching. 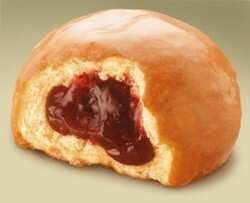 Thank God I'm at a party where we are lucky enough to be eating paczki's (pronounced POONCH-kee)—the Polish doughnut you eat the night before Lent starts. 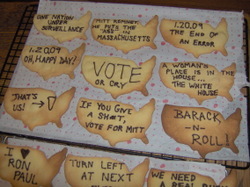 And when I'm done with that, I'm going to move onto these delicious Election 08 map-snaps. I will try not to spill any jelly on my "Irish Americans for O'Bama" t-shirt. P.S. We're taking t-shirt orders. Will I lose all credibility here, especially on the eve of the year's most exciting day yet (Super Tuesday), which I plan to pontificate on, if I tell you that I had a great great time watching 27 Dresses at a multiplex yesterday? It was perfect. Katherine Heigl has good comic timing—that's all there is to it. And the rom com had all the necessary components: a hot boss, a bitchy sister, a cute Manhattan apartment that is way bigger than what a real 20-something secretary living in New York would ever be able to afford, and a super-cute cynical journalist whose only fault is accidentally lying to the subject of his big-break article, providing the audience with the obligatory moment (not more than that) of concern that his lapse of ethical judgement might stand in the way of our perfect ending. I think you might be able to guess how that worked itself out. And so we smiled and said "ahhhh..." and walked out to have our parking ticket validated.